Okay, here’s a trivia question you can spring on your obnoxious friend who claims to know everything about the movies the next time you’re at your favorite watering hole and you’re playing Movie Trivia for drinks: What do John McClane and Sherlock Holmes have in common? Take a minute and think about it yourself before reading further. When the movie begins, Holmes has prevented an assassination planned by Moriarty and has tracked the criminal mastermind to his lair, a room full of ingeniously hidden death traps. Moriarty has Holmes right where he wants him; at gunpoint but he lets The Great Detective go, saying that he has another plan for Holmes. And that plan involves a crime so titanic that Moriarty assures Holmes that it will be remembered as the greatest crime of the century and the best part is that Holmes will not only be unable to stop Moriarty but when it is learned by the world that Holmes refused to solve the crime, his reputation will be forever destroyed. Holmes pooh-poohs this away and returns to his lodgings at Baker Street where he and Dr. John Watson (Patrick Macnee) await their next case. The case comes in the form of a pair of torn up theatre tickets sent by the actress Irene Adler (Charlotte Rampling), the only woman to have ever outsmarted Sherlock Holmes. Irene’s play is in New York and so Holmes and Watson are also soon in New York as Holmes is worried that Moriarty will try to hurt Holmes through her. 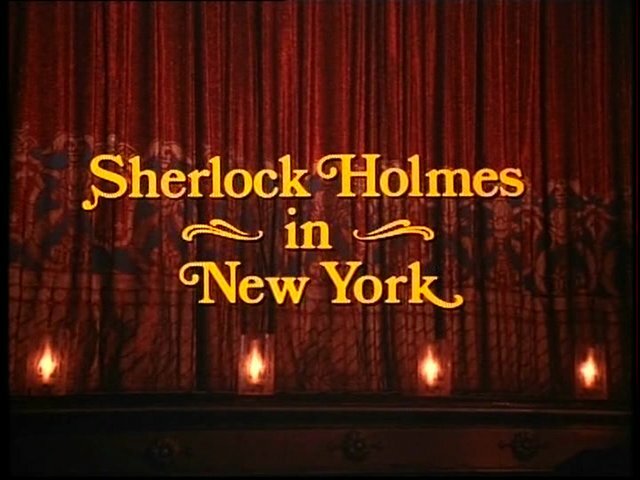 It turns out that Irene never sent the tickets and she tries her best to persuade Holmes that nothing is wrong but it isn’t long before Holmes deduces that Irene’s son, Scott has been kidnapped by Moriarty who loses no time in sending Holmes a message that when the New York Police come to him for help he is to refuse his aid or Scott Adler will die. Sure enough Inspector Lafferty (David Huddleston) and Mortimer McGrew (Gig Young) are begging Holmes to solve a mystery that appears to be supernatural in origin. Every single bar of gold has vanished from the underground vaults of The Federal Reserve Bank. Nothing has been damaged or disturbed. All the huge doors are locked and there is no sign of any tunnels or digging. To the human eye it appears as if all the gold has simply evaporated into thin air. Not only American gold but gold kept there by many of the world’s nations to be used for mass gold transactions. And in three days there is to be an important gold exchange made. Once it is learned by the governments of the world that a sizeable amount of their gold is gone there is the likely chance that a world war will break out. Despite all this, Holmes refuses to help. The outraged Inspector Lafferty swears that when it is discovered that the gold is missing he will be sure and let the world know that Holmes was asked to solve the mystery and refused. Holmes at last understands what Moriarty meant when he said he was going to pull off the crime of the century and that Holmes would be unable to stop him. But the solution seems simple to the ever-faithful Dr. Watson. Holmes has to find and rescue Scott Adler first and then find the gold. Can Holmes rescue Scott Adler and recover the world’s gold in three days and stop Moriarty’s plans to launch the world into global war? I wouldn’t dream of telling you how it turns out in case you want to ever check out this movie for yourself. And do I really have to? I’ve gone on record as saying that I consider Roger Moore a poor James Bond but I found that he’s a really good Sherlock Holmes. He’s nowhere near as good as say, Frank Langella, Peter Cushing or the great Basil Rathbone. And his performance doesn’t come within a light year of Jeremy Brett’s or Robert Downey, Jr.’s but that’s okay. Moore appears to be having a great time playing Holmes and certainly he treats the character with more respect than he did James Bond in most Bond movies. As Dr. Watson Patrick Macnee plays the character as slightly on the slow, bumbling side in a manner that reminded me of Nigel Bruce who for many years was the definitive Watson when he sidekicked Rathbone’s Holmes. I’ve never liked seeing Watson played as a dimbulb but thankfully Macnee doesn’t go overboard here. He and Moore obviously like working together and it’s apparent in their scenes together. Charlotte Rampling is extraordinarily beautiful in this movie and the relationship between Irene Adler and Holmes is complicated and there’s a secret between them concerning Scott that really isn’t much of a secret and you’ll certainly be able to guess it halfway through the movie. John Huston makes a great Professor Moriarty and he takes every opportunity he can to steal every scene he’s in. So should you see SHERLOCK HOLMES IN NEW YORK? If you’re a Holmes fan I’d certainly say you should check it out. It bends some of the history of Sherlock Holmes a bit but doesn’t break it altogether and the writer as well as the cast certainly seem to have a healthy knowledge and respect for the character and the movie is filled with little Holmesian bits that made me smile. 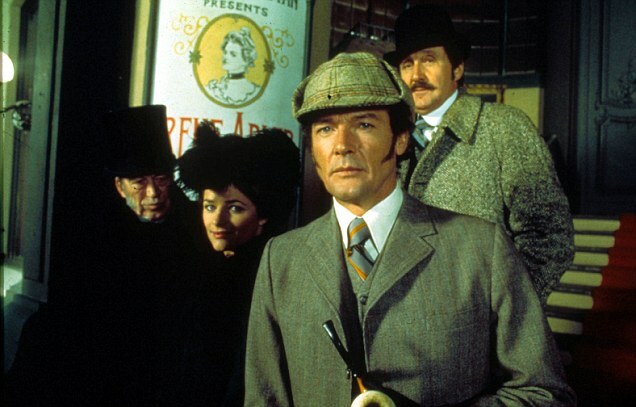 It’s worth seeing just for Roger Moore’s performance as Holmes. He gets a chance to play a character that uses his brainpower rather than his brawn and he does it quite convincingly as well as conveying the egotistical intellectual arrogance of the man. But he also nails down the overwhelming passion to see justice done that Holmes possesses and his seldom seen emotional side. SHERLOCK HOLMES IN NEW YORK is solid, satisfying entertainment It’s available in a non-USA format DVD you can purchase through Amazon.com but if your cable/satellite provider carries the Fox Movie Channel look for it to show up there. If you’re a Sherlock Holmes or Roger Moore fan, I don’t think you’ll be disappointed.